Barton Creek is a 4000 acre master planned country club community located just off RR 2244, or Bee Caves Road, in West Austin just 15 minutes from downtown Austin. This is luxury real estate at its finest. The community is highlighted by the renowned Barton Creek Resort and Spa. Home ownership in the community comes with a requirement to join with a social membership to the Resort and Spa. With the membership, you will enjoy the privileges of dining, social events, swimming and use of the spa and fitness center. Within the community, there are a number of luxurious gated neighborhoods all having their own wonderful distinctions. This is an amazing community for those wanting golf course property and custom homes. 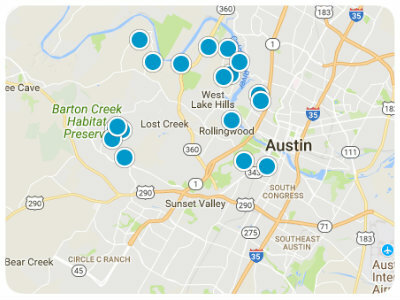 Recent average list price for the homes in Barton Creek is approximately $2,100,000 with the average square footage of 5700 sq. ft. The home search below provides a list of homes available in Barton Creek. Don't see what you are looking for? Contact us so that we may search the off market resources available to us to find your perfect West Austin home.